Check directly with the brand for the current offer. 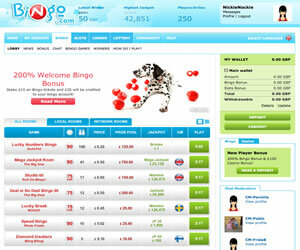 One of the first things users are likely to notice about Bingo.com is that its interface is particularly easy to navigate. It is neither too cluttered nor too minimalistic and contains the right amount of information that should keep newcomers and old pros alike happy. There is an abundance of cute looking dogs featured on the site, so if you are an animal lover you will enjoy visiting. Signing up is a simple process and can be completed in just a few moments. The site simply asks for details such as name, address, date of birth and a contact telephone number and allows the user to select their username and password. Once this is fully filled in people are given the option of making their first deposit (and entering their card details) or simply proceeding to the site and taking a look around. 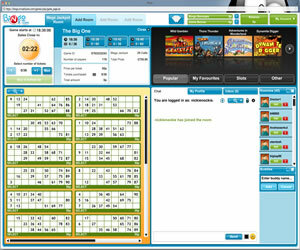 The home page clearly lists the various games available, with both 90 and 75 ball options on offer. The prize pool, jackpot and ticket price is clearly displayed so gamers will find it easy to select the option that they think will provide them with the best chance of winning big. Once the time comes to make that all important first deposit wannabe players will find they are able to add as little as £4.00 and as much as £800.00 to their account so all budgets are able to get involved and start enjoying themselves. People wanting to win big money might like to enter the appropriately titled Mega Jackpot room. Tickets can be purchased one at a time or those wanting to increase the likelihood of them walking away with some money can purchase the maximum number available. Prizes are given out at the one line, two line and full house stage, so there are plenty of opportunities to win. Those hoping to provide their bank balance with a serious boost might like to keep their eye on the Mega Jackpot, which can be won when a fullhouse is completed in a specified number of balls or less. Games start regularly so there shouldn't ever be too long to wait before bingo fans can get the action underway. Another feature of the website that is a welcome addition is that it contains a comprehensive Frequently Asked Question section that should satisfy almost all queries and prove particularly useful for those who are new to playing bingo online. A clear explanation is given about how cash prizes can be won and '“ crucially '“ about how the money can be withdrawn. There is also live support on offer should any problems arise during use of the site. Overall, Bingo.com is well worth a closer look for both those who are experienced at playing online bingo games and individuals who are perhaps looking to give them a try for the first time. Bingo.com offers a great selection of bingo variants at their site. You have your standard 90 ball games alongside a selection of themed games like Deal or No Deal Bingo and Lucky Numbers Bingo. The 75 ball offerings at the site include pattern and Swedish games so you are spoilt for choice. 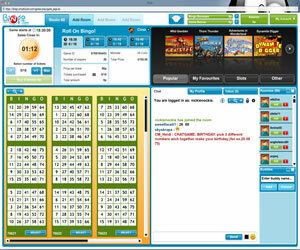 As well as bingo the site offers a whole plethora of instant win games to compliment the bingo games. 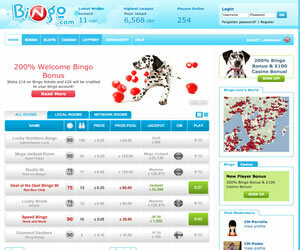 Wagering is considered met when you have spent your original deposit with Bingo.com.